Tags: Antique Map, Asia, Banda, Indonesia. Antique Map Banda Islands by Janssonius titled ‘INSVLARVM BANDANENSIVM Noviffima delineatio AMSTELODAMI Apud Ioan Ianfsonium’. 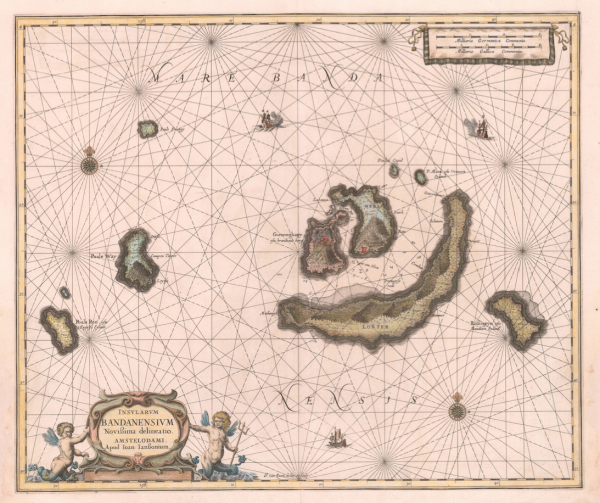 A rare and beautiful mid-17th century sea chart of the Banda Islands in the South Moluccas, the only source of nutmeg and mace in the world up to the end of the 18th century, by the famous Dutch cartographer Jan Jansson often referred to by his Latinized name, Ioan Ioanssonium (1588 – 1664) and published in Amsterdam in the Dutch edition of his five-volume sea atlas Atlantis Majoris Quinta Pars Orbem Maritimum in 1652. The map was engraved by Jan van Loon (c.1611/14 – 1686) of Amsterdam. Very good condition apart from some staining in the paper of the right-hand margin that is only on a light table; measures 441 x 528 mm.